Darren O’Dea has hailed Celtic teenager Kieran Tierney – and insists he’s far more consistent than he ever was during his own Parkhead days. Former Parkhead defender O’Dea, now starring for Dundee, has been bowled over by Tierney who has made the left-back position his own for Ronny Deila’s title-chasing side at the expense of Honduran Emilio Izaguirre, and was further buoyed by making his Scotland debut in the midweek friendly with Denmark. O’Dea, 29, first broke into Celtic’s top-team ten years ago and went on to enjoy a further six years playing for his boyhood idols. As he prepares to face the Scotland new boy in Tuesday night’s re-arranged Dens Park clash, O’Dea, who made his debut for Celtic at 19, said: “He’s handled everything really well. I like him –he’s a seven or eight every week. “He’s not doing anything remarkably special. But that’s the sign of a good player at that age. He’s already got that in his game which is remarkable. “I just know by the look of him – and speaking to other people – that he’s level-headed. He’s just made his Scotland debut and has the potential to have a fantastic career. O’Dea is relishing facing his old club for the first time since leaving Glasgow in 2012 and returning to Scotland back in January following a spell in India. But the Republic of Ireland international won’t allow sentiment to get in the way when Deila’s men roll up on Tayside. O’Dea said: “It will be a bit strange for me playing Celtic for the first time. But when you start the game you just want to win. That’s all I’ll be thinking about. “There are no friends on the field in this game, that’s for sure. “It will probably be more strange for my family to see me playing against them, rather than for them. But I suppose they’ll need to get used to that as I’ve signed here for a few years. “Of course, I’m looking forward to it because it’s against the best team in Scotland. 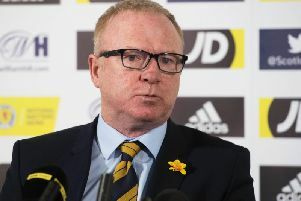 “It will be tough and certainly different than what it was at Celtic Park a few weeks ago. I think sometimes away from home you can sit in and soak up the pressure, whereas at home there’s a bit more pressure on you to go on the offensive. “With the players we’ve got here – containing so much attacking threat – I think there’s always an expectation to go forward. “I’m looking forward to it though and obviously I’ll know a lot of faces. “I’m still in touch with Charlie Mulgrew and Scott Brown, who is a best mate of mine. “But it’s more those behind the scenes as I know everyone from the cleaners to the groundsman. “I doubt if there will be much banter before the game, as that will probably come after the 90 minutes is done and dusted.